I have been a fan of Paul Simon for many years. When I discovered him in 1990 (thanks to his Greatest Hits being played by my mum) I had already missed the phenomena that was Graceland, but all that meant is that I could discover the wonder of his work from his time with Garfunkel in the 1960s to his wonderful growth through the 70s and miraculous rebirth in 1986 with Graceland. It is amazing that he is someone who has been on the scene since 1964 and yet has only released 15 full albums during this time. In comparison Bob Dylan has released 35 in the same amount of time? Though it is quality, not quantity and that is certainly what you get from a new Paul Simon album. Stranger to Stranger is (no pun intended) a strange album. Consisting of 11 songs (16 if you get the Deluxe Edition) there are no songs on the album that jump out at you as a hit song and in the era of downloading and cherry-picking songs it is nice to have an album that is a collection of songs. This is not to say that the album is throwaway, if anything it feels more like a concept album with use of sound effects and instruments to punctuate certain songs. A lot of comparisons are being made with Graceland, but really the two albums that come to mind are The Rhythm of the Saints and his work on Songs from The Capeman. The use of bells on certain songs such as In A Parade and Cool Papa Bell almost songs like a companion song to Rhythm's Spirit Voices. Wristband is the song that Simon has been performing regularly to promote the album and it is certainly the most infectious and uplifting of the songs on the album. A lot of the songs feel almost like they should be part of a score to a film with The Clock being a very eerie instrumental piece almost reminiscent to the work of Clint Mansell. Very few songs are epic, long numbers with only one Proof of Love going passed the five minute mark. If you bought the Deluxe Edition, you are also treated to an additional five songs. Horace and Pete and Guitar Piece 3 both feel like they could have worked within the album, though Guitar Piece 3 is once again more or less an instrumental. His duet with Dion New York is My Home is fantastic and it is a surprise this wasn't released as a single to promote the album more. Live versions of Wristband and Duncan from his debut solo album Paul Simon are as great as you would expect from Simon live. The interesting thing about Duncan was how well it fit in with the almost talk/sing style that Simon has developed over the years. With every new album that Simon releases it is custom to wonder what he wants to say to the world. Since Graceland very few of his songs have really hit home with the public and become part of your musical life. It is not uncommon to hear Fifty Ways to Leave Your Lover or You Can Call Me Al, but it is very rare that you will hear anything from his last few albums. It always reminds me of the Radio DJ from Simon's film One-Trick Pony telling his character that his songs need to have a hook, but it never feels that Simon's songs have that anymore. That is not to say his music and songs are not beautiful. I listened to this album twice through and each time felt a warmth of emotion come over me. It was nice to listen to music that doesn't have an agenda or forcing itself to be relevant. That is the beauty of Paul Simon's music. It is timeless. This isn't an album of pop songs that will be forgotten about in a year and only become retro-chic in a few decades, this is an album that will always be relevant. It may not have the epic-ness of Bridge Over Troubled Water or the lyrical virtuosity of The Boy in the Bubble, but it is music that will never feel dated. 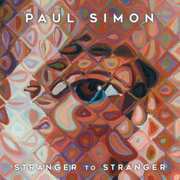 Stranger to Stranger is certainly Simon's strongest album since Graceland and if you are a fan of his work you will love the evocative guitar work and beautiful singing. If you are looking for an album to put on while you lie on a sun lounger with a cool glass, then you will thank me for picking this one.